I don’t know if you’ve been paying attention to this, but lately there’s a battle raging between Google and the Chinese government. It’s kind of interesting when a company is big and influential enough to wage a political war with the biggest government in the world, eh? In January, Google announced it is no longer willing to censor searches in China and may pull out of the country. In February, Google reacted to attempts to hack into Gmail accounts of Chinese dissidents. The implication was that the Chinese government had done this. “Google has violated its written promise and is totally wrong by stopping to censor its Chinese language search results and blaming China for alleged hacker attacks, ” the Xinhua news agency quoted an official in charge of China’s Internet bureau as saying. The Chinese internet is protected by “The Great Firewall of China” which blocks tens of thousands of websites and search results. It started in 2005 when Google entered the Chinese market, agreeing to censor search results. When you google “Tiananmen Square” in China, you get a friendly page about the biggest public gathering place in Beijing. 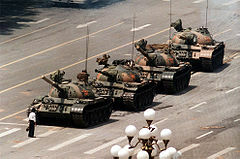 In the rest of the world, you get the world famous picture of a brave estudiante squaring off with a tank in 1989. I have a different opinion. I’ve traveled to China 3 times. Bryan Todd (my AdWords Definitive Guide co-author) lived in China for 4 years and speaks fluent Mandarin. I saw this as China letting the camel under the tent. The toothpaste is out of the tube. Planet Earth is experiencing an irreversible transformation of equality and human rights. Every cell phone, every internet connection and every online business connects another human being to 2 billion other people around the world. Whether by tanks, bulldozers, earth movers, erosion or Blackberries… sooner or later, the barrier will dissolve. It’s only a matter of time. Don’t forget how fast the Berlin Wall came down, once the process began in earnest. * Retained the option to redirect the traffic back to China.cn if an agreement with the Chinese government can be reached. Free speech mavens are understandably impatient to see the wall come down. However I suggest that caution is in order. We don’t need a bloody revolution. Another thing to consider is that Google is far from the only search engine in China. Rivals like Bing and Baidu, by being more cooperative with the Chinese government, will easily fill the missing space. Moving too fast on this could simply kill Google’s Chinese business. “Bejing’s going to win this one. But not without losing a lot of face in the process. Pyrrhic victory, perhaps. I think he’s right. Whatever happens, Google might make it sound like they won, but in the short term they’re going to have to do business on Beijing’s terms. Plus, if Google can ignore the biggest government in the world, it doesn’t necessarily bode well for us advertisers. Maybe it’s not so surprising they don’t answer their customer support emails after all. I may have run afoul of the latest battle. My ad was clicked tens of thousands of times by Chinese game sites in about 12 days. The ad was for U.S. tax return preparation for expats. Google’s supposed 3 tier protection identified some false clicks, but I was charged for most. Google insists the clicks are good, even for those sites where purported impressions exceed pageviews as reported in Alexa. I’m considering suing to recover fees paid for the clearly bogus, likely machine-driven clicks. Have other advertisers encountered this lately? If I were running a war, this would be a great tactic: kill your enemy’s customers. I do not often hear stories like this, though lately I’ve heard a couple – after not hearing complaints about clickfraud at all for quite some time. There are some weird parallels to the story of Adam and Eve, which discussed heavily the consequences of eating the fruit from the tree of knowledge. In Genesis 2, Adam and Eve chose Google, and now we don’t get to run around naked or live to be 1,000 years old. Does that make Moses and the authors of the Torah who were “divinely inspired” to write these passages… equivalent to China? Probably the wrong forum for this, but hmmmm. I wonder if Google’s ‘battle’ with China is a smokescreen for something else – like their own incompetence. I’ve been on the Blogger Help Forum these last few days talking to people who’ve had their blogs classified as ‘spam’ and deleted; falling victim to the ‘false positives’ of Google search algorithm. I’ll spare you the long boring rant, born out of tedium and frustration of trying to wrestle answers from the Central Committee of The Communist Party of Google. But two questions emerge out of this. First point, what does it all say about the integrity of Google’s search algorithm that their own admission that it’s spam detection techniques are ‘inherently fuzzy’? We already are Clelland. It’s that kind of greed and apathy that got us into it with China in the first place. With “allow” I didn’t really mean like they have a real control over China, but more like that they will try everything they can to encourage China to become more democratic. And at the same time they will also try to discourage any action that enforce China’s goals to maintain their somewhat dictorial system. I agree, it’s not like the US or any other country for that matter, can simply tell another country how to run their affairs. The word allow was more to show what the USA governments interests are. Planet Earth is experiencing an irreversible transformation of equality and human rights. I’m not sure if this is true Perry or maybe it’s going slower than I would like it to. I beleive our challenge globally is for sure the mainstream media,most governments (ours in Canada for sure),SCHOOL SYSTEMS run by of course our governments,and large corporations like google and many others who are tied to our governments who do one thing very well…THAT ONE THING IS TEACHING THE MIND SET OF SCARCITY. I think the internet as a whole can reverse this but how long will that take and will it happen before our governments take control of the internet? I’m not a fan of communism or socialism which here in San Francisco lite (Toronto)I think our government really is not that far from complete control mostly by way of taxing us to the poor house. Communism is 100% taxation which we are approaching since we are at 60-80% taxation….but you and I both know what it’s about in China and that’s total control of their vast population.They wuld like the same here. I’m going to offend some here but it’s truth to me and that is that your administration in charge now seem’s to be pushing towards their marxist agenda much like we have here in Toronto. If our N.A. governments keep going in the direction of the Chinese I think you folks in the states just may have a revolution Perry. We must do what Buckminster Fuller said. The following statement by Fuller in the 1970’s was later proven by an eminent group of scientists to be true. Of some fifty predictions Fuller made forty eight have come true. “We now have the know-how, and the resources to feed, cloth and shelter every human being on our beautiful small planet, and to do so at a higher standard of living than anyone has ever known”. Our current ‘economic system’ is based on “scarcity”, on “misinformation” and “old, out dated thinking”. It struggles to see it’s way clear because of all the rules and regulations set up to protect us; but which actually suffocate the majority of hard working human beings. He also says if we can start promoting the opposite that eveyone on planet earth can be a billionaire. I’m part of a program and won’t spam it here based on Bucky’s philosophies. This is where the internet will shine Perry but only if governments like China open up instead of keeping on looking for more ways to stifle and control us. Your articles are great man. They make me think and stimulate me often. 1. Is censoring free speech evil? 2. Did Google knowingly censor in China for 4 years? 3. Did Google only stop censoring in China due to alleged hacks to “their” servers? 4. Would Google have continued to censor if there were no server attacks? 5. How can Google conspire with the enemy, of free speech, for 4 years and then take the moral high ground – only when their servers were attacked? 6. Does Google turn over “dissident” information to protect the USA? 3. + 4. + 5. + 6. Do you really believe this is all Google by itself doing all this stuff? The US Government is involved here. You can be sure of that. There’s nothing wrong with that in my opinion. Google entered China with the logic that not providing services in China is more evil than providing services with censorship. Then imagine what happened when these server attacks happened. It created an opportunity for the US Government to open up China to more democracy. The only way that the USA is going to allow China to become a world power is by China becoming a democracy. Democracies don’t thrive with war. Only dicatorships do. So they “worked” with Google. You don’t get to be in an international incedent on this level without your goverment getting involved as well. is doing to censorship in this country. Sensorship isn’t an issue here. And you can’t really call it “working together” either in my opinion. I think they´re involved. Not the same thing as working together. And the US goverment isn’t going to tell what Google can and can not do, unless unless it’s related to some national security issue. A government doesn’t even want to be working on the PR of companies. Only if there’s a real interest, they’ll get involved. The USA is not a dictatorship. Sorry on the “worked” together part – just using your term in your 1st reply to my post. I believe Google (and co-founder Brin) are letting personal emotions get too involved. Great to have a socially responsible company and an idealistic view of the world – but this is business, and politics, and a quagmire of issues way beyond the capacity of a bunch of PHD idealists who have been in business for 10 years. Google will sacrifice, at a minimum, 23% of the market (and growing) as well as the tangent opportunities by not choosing to follow tactful resolution of the alleged server attacks. Not to be too bold or insulting – but you are woefully naive to believe that the U.S. Government is in a position to “allow”, or not allow, China to become a world power. Time will tell, but this “company” is treading on dangerous ground. But the fact that Google once and for all makes a political stand against China is positive. And their lack of cooperativeness often makes their service better for customers.. But yes, they are slightly unpredictable. It had to be Google who pulled out of China! 1) Censorship exists everywhere in the world. Thinking that you can get any information that exists freely anywhere in the world is naive. Google also censors data/information here in the North America for the sake of the “homeland security”. 2) When doing business in a country, try to respect the law, customs and ideology of that country. 3) Hong Kong is a special administrative territory of P.R.China. It is not longer a British Colony. So if Google has the balls, why just redirect traffic to H.K., might as well get the heck out of the entire Greater China. After all, Google still gives in, just that it wants to act like a freedom fighter in front of the western world hoping that people don’t know who the real boss of Hong Kong is. 4) How the heck Google knows that those “hacked” email accounts belongs to political dissidents? The Chinese government definitely won’t tell Google that. So which other “Big Brothers” helped Google to put the puzzle to together? Did you get the picture? I liked your opinion a lot. I can understand your situation as I’m also living in another country than I grew up in. When doing business in a country, and the laws, customs and ideology are (to a certain degree) in conflict with your own laws, customs and ideology, what do you do? This is a very important issue. A company like Google avoiding a country like China because of some differences in ideology would be considered evil just as much as a Google entering and trying to deal with it. There is no 100% correct way to deal with these kinds of things. Many companies just addapt to the laws of China because they have no choice, but they also have the advantages that nobody really cares. They don’t have public opinion to worry about. And the Chinese government also doesn’t have to worry about public opinion in these cases. But a very well known company like Google finds it self in a very different position. Public opinion is very important here. And even for the Chinese government it is very important. They can’t ignore public opinion. In this case, “public opinion” relates to the whole world, not just the Chinese population. Google is Naive and Ego-driven… is all I can say. Who cares? less than 1% of the Chinese people are actually depending on foreign internet sites in the daily basis. Google already failed its market share in China to Baidu, Microsoft, Sohu, Alibaba TaoBao, Sina, etc.etc.etc. and many more, at the moment they entered, with or without the political “movement”. Google needs to take care of its own privacy problems. The bottom line is that their agreement was too convenient to last. Google is most definitely an arrogant company, and for this reason it’s simply a matter of time before they start to slip. Historically, every “tyranny” has followed the same almost-predictable pattern of self-sabotage. In almost every case, the nation or ruler develops a sense of invincibility, which leads to apathy (thinking they can do anything) – which, as we know, inevitably leads to destruction, dilution or corruption from within. Already, there’s some other emerging players on the scene (Facebook), and that will only continue to happen. Heavy lies the crown, Google. Except that you forget – you’re just an internet service. So when do you predict this will happen to China? I think Google made a good move here. Change will not come quickly to China. Small steps in the direction of freer flow of information and increased connectivity with the rest of the world are the best way to go. China is growing at a very rapid pace, people have more means and access to information (which is good), but it could be also too much too fast and could stir things up unnecessarily (which is bad). In China’s eyes, they are just catching up the best they can and some things have to give. (Not saying that I agree with some of the horrific things that they do). With the Chinese, you need to give ‘face’. Back room negotiations have always been more fruitful whereas full frontal confrontation is the kiss of death. Sure Google looks brave and honorable but how much of it is a ploy is debatable. So Google is all squeaky clean? To me, it’s a bit like “the pot calling the kettle black”. Google has re-directed traffic through Hong Kong which I can assure you, means Hong Kong will be under loads of pressure from China. With all Google’s savvy in marketing etc… surely they could have done it differently. And anyway, why did they sign this agreement in the first place? The best is yet to come…..
You have to give in to the Chinese governement. They are big and self sustained, they are like a world by themselves. Give it another 20 years, you will see many google created in China. I think it will take longer for China to have a global focus. Language differences will always exist and cultural differences take longer to change. China is communist country. Their government censors everything. No surprise here. If Google wants to to business with them, then they have to play by China’s rules. We’re supposed to be a free society with Free Speech, protected by the First Amendment. But that’s not really the case anymore. We’re getting a heavy dose of censorship ourselves, whether we realize it or not. Great to see someone stand up for basic human rights. I’m a google advertiser but we shouldn’t let money compromise our stance on free speech. A country, such as China, that turns its military on its own people should not be respected. Google will only gain significance & credibility by taking this hard moral stance. I only hope more corporates follow. Well done! Don’t know whether Google had an attack of conscious or had always intended to change their terms once they got into China. Either way, it sounds like they did violate the terms of their written promise and cannot be trusted. The government in China had an agreement with Google. Google should not have violated that agreement. Or they never should have agreed to the censorship in China in the first place. By many accounts it appears as if Google is a self-righteous, arrogant “business” that “knows better than everybody else” and does what it wants – regardless of its motto and the law. Still want to see what Rupert Murdoch and the copyright laws have to say about the almighty Google. Can’t wait to read the scathing insider report that “tells all” about what Google has done to manipulate results,,stifle competition, and knowingly violate the law. Don’t believe they’ve got skeletons in their closet? Yeah, and Toyota is most concerned about user experience – not profit. Before google there was altavista, and I still use it as my search engine. I am glad Google told China basically to take a hike. They are evil and I am sick of every other country and business pretending that they don’t have human rights issues, so that they can make a buck. Sure Google has a double standard many times, but in this case I think they are correct. If the China is so keen on censorship why don’t they censor Their Own ISP companies? Track your spam origins, you will find out that The Most spam is coming out of China!! So how can “We” protect ourselves from China? I wouldn’t mind if the Chinese goverment would “protect” their citizens from ever entering Internet at all. 75% of the spam would simply dissappear overnight! I wonder how this will affect the ‘privileges’ that the Chinese government extend to Google Hong Kong? I guess they don’t want Google having to redirect google.cn to http://www.google.com.tw/ instead though. Dare I say that Google is creating a new marketing campaign that can win a certain niche of Chinese culture not unlike what we do with Perry’s teachings? Baidu might have most of the populace, but if Google markets to the subversive few. It can win a market share that Baidu can not because of compliance. Why not turn a marketing weakness into a strength and encourage the free speech of dare I say, Chinese beatnicks? Obviously this can’t be done overtly. But it’d be an interesting marketing ploy. I think that the cache: option in Google is going to be very popular in China. I’ve always felt it’s easier to impact change from the inner circle vs. the outer circle. Thus, knowing what little I know about the China government, Google won’t be back in China for a long time. While it will get Google some kudos short term, they won’t get back into China long term. In the end, Google will look like a child taking their ball and going home. We may not like the fact that China does this, but it is their game. Learn to play by the rule makers rules and then influence the rule maker to change the rules. Google is concerned with the free speech in the world and slaps thousans of accounts every day from the searches for posting ‘unwanted content’…..
As a frequent traveler to China in my previous business life before becoming an Internet junkie (the Spice business) I can’t agree more. In fact the one thought that kept going through my mind when I was over there was the observation that the younger generation wanted no part of the oppressive ways of the Communists. The people I met in the food processsing plants throughout the country were highly motivated, hard working and capatilistic in nature. I’ll always remember one trip when my driver couldn’t contain his excitment because he and his brother were in the process of setting up a company to export beanie babies to the US (I think this was probably around the late 90’s). Anyway, he had made a deal with a importer here in the states, who was going to do all the distribution stateside. It was quite an eye opener on my end that a people held down so long were busting out of their chains, regardless of the still rigid government controlling their lives. Google has always been evil, as I’m sure many AdWords customers agree. Any company that claims a motto of “don’t be evil” has already specified that it IS evil, merely by claiming not to be. If the brain hears negatives last, the real motto is, “Be Evil; don’t”. It’s support of dictatorships, and refusal to acknowledge self-defense — not only of its customers but also its employees — are two drops in the bucket of Google evil. Thankfully, over a decade ago a now-deceased private investigator recommended a superior SE to me. Why do we say we are the defenders of liberty, freedom of speech and democracy and then let China trade with us with few restrictions, bolstering their government? Why do we have severe restrictions on trade with Cuba and fully open markets with China, when the record on civil rights is probably worse in China? Why do we let China have open access to our markets when we do not get the same in return? Why do we allow China to sell their goods in the US at artificially low prices when they brazenly manipulate the Yuan and all we get in return is some cheap goods and the loss of literally millions of jobs that are not coming back? I’m not saying we should stand one way or the other, but maybe we should consider these questions as we contemplate how we work with China moving forward. If you did, the only thing that can happen is world war III. And China would not have a chance militarily. They are still LDC when compared to the US. Maybe economic WW3, but are we just going to sit back and continue to let them exploit us? I agree with Bryan, China will ultimately win this one. What’s funny though is that Google has enough power to piss off the Chinese Govt! That, in my opinion, proves that Google is entirely too powerful. Not only is it funny, but kinda scary as well. The legend of the Big “G” continues to grow! I agree with the entirely too powerful. And to me…it is scary. In spite of the fact that Google is a “worldwide” company, it originated in the United States. I’d hate to see China fluff up their feathers against the US as a whole just because of one powerful company’s decisions to stand up to them. Anyone have historical examples of how other large companies have influenced love/hate/peace with other countries? It will be an interesting chess match to say the least. Google still must make money and it is hard to ignore a 1 billion person market where they can get advertising dollars. They may be trying to win public favor with the rest of the world however at what cost? It’s good to see that finally someone in this spineless country is standing up for freedom of inquiry. Our President is so busy prostrating himself before foreign tyrants and monarchs while the UN is busy prohibiting any criticism of Islam as ‘hate speech’ that it is refreshing to see someone take the side of the common man and common sense. Let’s hope other American and foreign companies follow Google’s example. Google is a business making a business decision. Redirecting to Hong Kong was smart, but this whole thing was predicated by the hack attack Google felt was perpetrated by the government. An interesting question for me is to question how much gets censored here in America. It’s definitely not the way the Chinese government does it, but it happens… No? If Google co-operate with US law enforcement authorities on matters like the Patriot Act, why not co-operate with their Chinese counterparts on what they would equally regard as ‘law and order’ issues? What’s the difference? Would someone from Google care to answer? The only real difference I can see that when the Chinese situation is discussed it is referred to as an issue of ‘censorship’. On their home turf it becomes a ‘privacy’ concern. But aren’t privacy and censorship in opposition to each other? To a certain extent anyway? This goes way beyond decisions about how to staff customer support. If the public begins doubting the relevance of Google’s search results then they’ve lost their core competency. Regardless of the moral and free speech issues, their accommodation to the Chinese Gov’t was a serious attack on relevancy. I won’t predict who the winner or looser will be in this battle, but it sure makes for some interesting conversation. My big question for China is what do they have to hide by censoring search results? I’ve always felt that Google’s ego was out of control. They may have some great products and do great ‘search’ but that doesn’t make them fun to do business with. There’s actually been a few updates to this story. Google and China actually came to a deal over the amount of information they divulge. It’s very similar to the whole issue between RIM (research in motion) and Saudi Arabia where the blackberries are being pulled because the information and data goes encrpyted to the UK without the Saudi government being able to inspect the data for content they deem inappropriate (e.g., sexual content, terrorism and counter-intelligence, etc). It’ll be interesting to see how it all plays out in the long run – but right now both Google and RIM are cooperating with the governments and building data centres as a point of contact in those countries to allow the governments to inspect parts of the data (requests) before being sent out to the end user or to their servers. Como se diz aqui no Brasil, “uma briga de cachorro grande”. Ou os estados deixando o lugar para outras formas de organização. I agree with Bill, Oscar, Raza, Joseph, Tommie. and I STRONGLY AGREE with Clelland and Billy. And in the end, Matt makes a point. Especially as there are other search engines faring quite well in China already. But honestly – why doesn’t China censor the web themSELVES instead of forcing Google to do so? To me it’s that ‘simple’.